Information provided by www.Recalls.org, a private 501(c)(3 foundation. 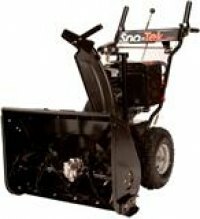 Liquid Combustion Technology is recalling Sno-Tek snow blowers sold nationwide and in Canada from August 2010 to September 2010. The snow blower's engine is missing a safety shield above the side mounted electric starter, posing a laceration hazard. The recalled snow blowers have a LCT StormForce engine with "Sno-Tek" printed across a metal handlebar plate. Snow blowers with model numbers 920402 and 920403 and UPC codes 5105803094 and 5105803095 are included in this recall. Only snow blowers with engine model number PW1HK18650781DE-ABGOQUVE1M with serial numbers ranging from 1065H04008325A through 1065H04012104A are affected by this recall. Monday through Friday or visit www.LCTUSA.com for a free repair kit and installation instructions. More info at www.recalls.org. posing a fall injury hazard. Perfect Pullup logo in white lettering across the top. Consumers should contact Perfect Fitness at (877) 974-7733 between 9 a.m.
to order a free handle replacement kit. More info at www.recalls.org. a risk of entrapment and suffocation. attached to the mattress support. for a free repair kit for recalled cribs. More info at www.recalls.org. standard for wearing apparel, posing a fire hazard. pockets and wide knit cuffs at the wrist. The style number is WOY2444. Balsam Hill LLC is recalling pre-lit artificial Christmas trees sold nationwide from October 2007 to December 2010. Christmas trees advertised before Dec. 21, 2010 as indoor/outdoor were supplied with extension cords rated for indoor use only, posing an electrical shock hazard if used outside. Models sold before Dec. 21, 2010 are affected by this recall. A complete list can be found at www.recalls.org. If consumers have used the tree outdoors or wish to use the tree outdoors, they must contact Balsam Hill at (877) 694-2752 between noon and 7 p.m. ET, Monday through Friday or visit www.balsamhill.com/recalls to receive a free retrofit kit containing an outdoor extension cord. More info at www.recalls.org. Burlington Basket Company is recalling bassinets sold nationwide from January 2003 to August 2010. If the cross-bracing rails are not fully locked into position, the bassinets can collapse causing the infant to fall to the floor or fall within the bassinet and suffer injuries. This recall involves all Burlington Basket bassinets manufactured before June 2010. Affected models have folding legs attached to the basket with white plastic pins. for a free kit with detailed instructions on proper assembly of the cross-bracing support rails. More info at www.recalls.org. Atico International USA is recalling TrueLiving Heater Fans and Portable Quartz Radiant Heaters sold exclusively at Dollar General Stores from September 2010 to December 2010. These heaters have caught fire, posing a fire hazard. Model and item numbers included in this recall can be found at www.recalls.org. Consumers should return the heaters to any Dollar General Store for a full refund. Consumers can also contact Atico International USA toll-free at (866) 448-7856 between 9 a.m. and 5 p.m. ET, Monday through Friday, or visit www.aticousa.com. More info at www.recalls.org. LEM Products is recalling food dehydrators with digital timers sold nationwide from August 2010 to December 2010. The screws that secure the motor to the back panel can come loose, causing the motor to fall on the heating element. This poses a fire hazard. This recall involves 5-tray and 10-tray LEM food dehydrators with serial numbers 2010 0701, 2010 0702, 2010 07021, 2010 0901, 2010 0902, 2010 1001 or 2010 1101. The LEM logo is embossed on the top of the unit. The serial number is located on the label on the back panel. Consumers should contact LEM Products at (877) 425-4509 between 8:30 a.m. and 5 p.m. ET Monday through Friday or visit www.lemproducts.com to receive a free repair kit. More info at www.recalls.org. Kristi G, SwimWays Corporation is recalling Kristi G Go & Grow Chairs sold nationwide from March 2010 to January 2011. The chair can tip over, posing a fall hazard. The recalled product is a lightweight, polyester chair for children three months and older, up to 75 pounds. The chairs differ in color scheme only as follows: model 80325 is brown with blue polka dots, 80326 is brown with green polka dots and 80327 is brown with pink polka dots. The model number is located on the box. Consumers should contact SwimWays Corp. at (888) 559-4653 between 8 a.m. and 5 p.m. ET Monday through Friday or visit www.kelsyus.com or www.swimways.com to receive reimbursement of the purchase price. More info at www.recalls.org. Walt Disney Parks and Resorts is recalling Children’s Light-up Watches sold nationwide from November 2010 to January 2011. Watch battery current interacting with nickel in the watch’s stainless steel back can cause skin irritation and/or burning sensations to children who are allergic to nickel. This recall involves Buzz Lightyear, Tinker Bell and Lightning McQueen brand light-up watches. Each model watch is sold separately and is intended for children ages three years and older. A tracking code is engraved on the back of the watch, as well as printed on the back of the packaging. The tracking code is: K130-6377-7-10187. www.waltdisneyworld.com for instructions on returning the watch for a $40 refund. More info at www.recalls.org. Nurses Choice Corp. is recalling Newborn Keepsake Mittens distributed by hospitals nationwide from October 2010 to January 2011. Decorations on the mittens can be pulled off, posing a choking hazard. The infant mittens are made of white cotton. They have candy cane, teddy bear and "2011" decorations glued on one side. Consumers should contact Nurses Choice at (800) 747-7076 from Monday through Friday 9 a.m. to 5 p.m. ET or visit the company's website at www.nurses-choice.com for a free replacement. More info at www.recalls.org.